Stena Line today says it is piloting an artificial intelligence (AI) system on board its vessels to help reduce fuel consumption. The system, being developed with Hitachi, aims to predict the most fuel-efficient way to operate a certain vessel on a specific route. Initially, the system is intended to be a support for the captain and officers as part of efforts towards hitting its sustainability target to reduce fuel consumption by 2.5% annually. The eventual goal is to create a model that is precise enough to be the ultimate decision support system for the captain when planning each trip. The first pilot study is taking place on Stena Scandinavica. operating on the on the Gothenburg – Kiel route. "Since we are helping the AI to evolve, we might be assisting the AI more than we are at the moment, but it is a very exciting and rewarding process. We've been making adjustments to the model after each trip for about four weeks and it is amazing to see how quickly it is learning", says Jan Sjöström, Senior Master at Stena Scandinavica. 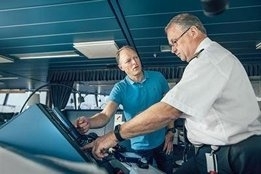 Stena Line says this is the first of several studies regarding AI-assisted ferry trips within its fleet this year, and it has an overall goal that the whole company should be assisted by AI in 2021.